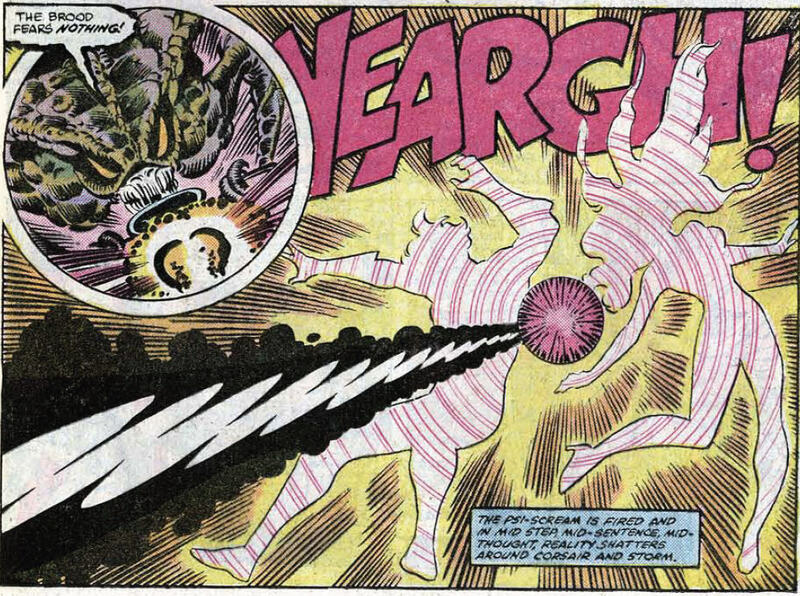 The rest of the X-Men and Tigra arrive, holding off Deathbird and the Brood, but Colossus is hit with a shell containing acid that starts eating through his armor. Storm is able to wash it away, leaving Colossus weakened but alive. As the X-Men charge into the unfinished skyscraper the Brood are using as a base, Colossus stays behind to guard Professor X. 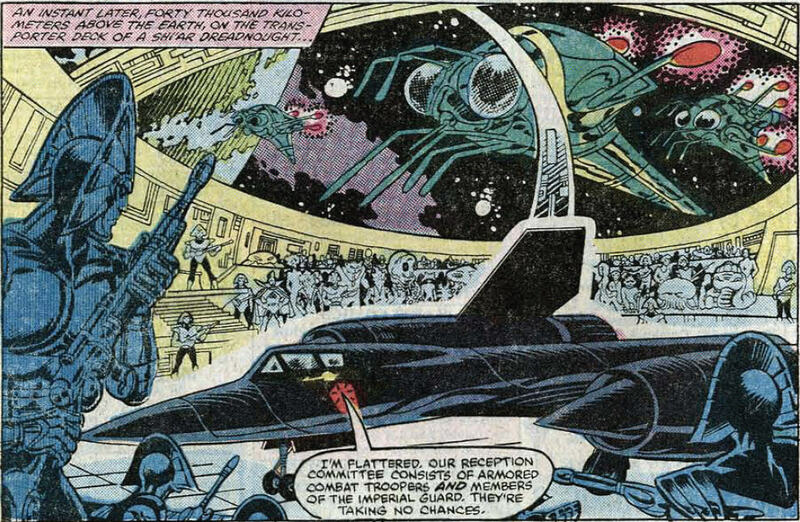 Inside, the X-Men manage to overpower the aliens, but Deathbird appears, having captured Professor X. 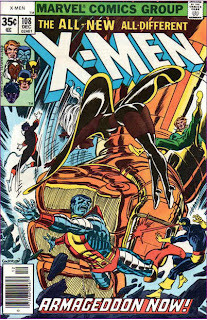 The X-Men are forced to let her leave, and suddenly, the skyscraper collapses around them as a starship hidden inside launches into the sky. Freeing themselves from the wreckage, the X-Men find Colossus, his chest pierced by one of Deathbird's javelins and apparently dead, just as the police arrive to arrest them. The Brood, a parasitic alien race, make their first appearance. They remain a relatively minor but still significant part of the X-Men's rogues gallery. Deathbird, after debuting in Ms. Marvel's solo title, makes her first appearance in X-Men. She will also become a significant part of the X-Men universe. 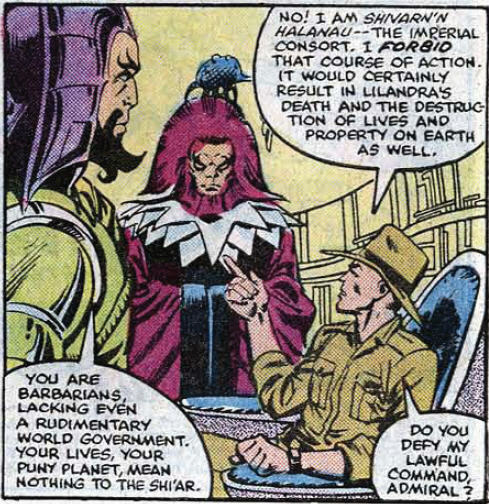 On a more minor note, Shi'ar Admiral Lord Samedar, mentioned last issue, also appears for the first time. Tigra, who at the time had recently joined the Avengers, guest stars (she appears here between issues #214 and 215 of Avengers). Born of Stan Lee's desire to introduce some series that would appeal to women, Tigra first appeared as the Cat in the early 70s (in a costume/gear that would later be appropriated by fellow Avenger Patsy Walker as Hellcat, who was a supporting character in Beast's Amazing Adventures series) before being transforming into a were-tiger and bouncing around the Marvel Universe for a bit, including this stint with the Avengers. Later in the 80s she would become a mainstay of the West Coast Avengers, and nowadays is featured as an instructor in Avengers Academy. Her appearance in this issue is largely superfluous, as she's simply the only Avenger who's home when the X-Men come calling. She helps out in the fight with Deathbird and the Brood and that's about it. I have no idea how her appearance came about. I can't imagine she was expected to generate a spike in sales; maybe Claremont just liked the character? 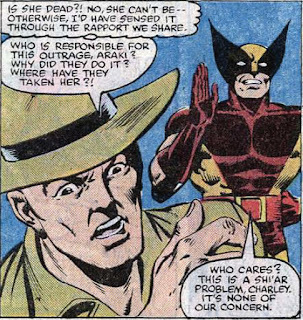 We learn that, in the Shi'ar language, Professor X is Shivarn'n Halanau. 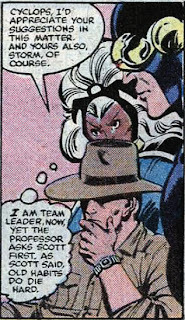 Storm is mildly resentful of Professor X turning to Cyclops before her. Kitty? Still spending a good chunk of the issue in a bikini. The Brood Queen is referred to as Mother-of-us-All in this issue. 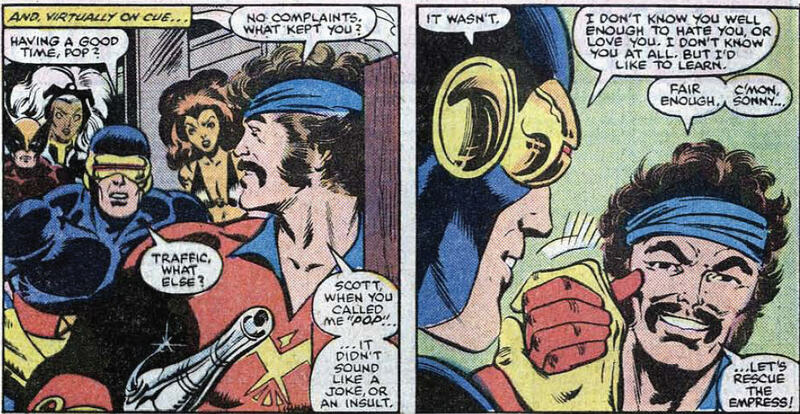 By the time they charge into battle together at issue's end, Cyclops has decided that he doesn't know Corsair well enough to love him or hate him, but would like to get to know him better. It cracks me up that in order to get in some exposition for first time readers, the admiral of the Shi'ar fleet has no idea who the X-Men are, despite their integral role in recent Shi'ar history and the fact that one of them is the consort of the Empress. The X-Men continue that time honored tradition of going to other superheroes for help only to be told they are away on a mission, only this time, Tigra is at least at home when they come calling and pitches in (not that the Avengers were in particularly good shape at the time; at this point, the only other active members besides Tigra were Captain America, Iron Man and Thor, with Yellowjacket having been recently kicked out after slapping Wasp and building a robot to attack the Avengers that only he could defeat in order to look good). In the name of plot convenience, with the fate of the world hanging in the balance and only 24 hours to find and rescue Lilandra, Storm and Corsair split off from the rest of the X-Men in order to, essentially, go sight seeing, allowing them to be ambushed by the Brood and Deathbird (and it's terribly convenient that the X-Men manage to track them down just as they're attacked). 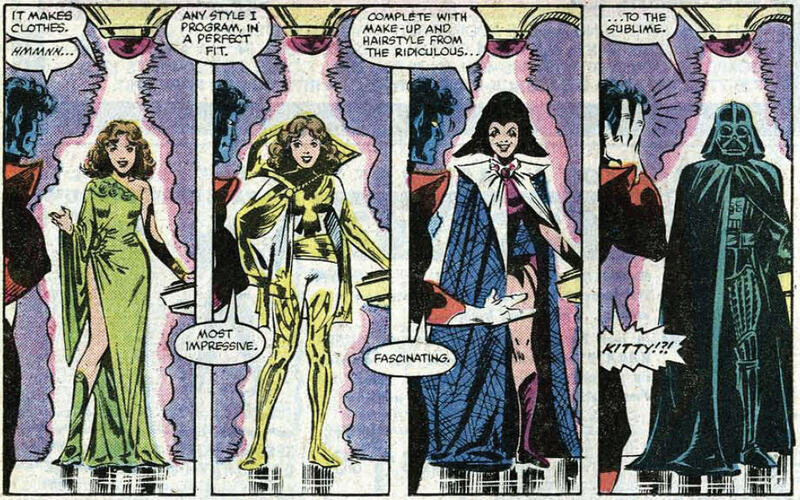 Kitty uses a Shi'ar machine to replicate a series of costumes, including Darth Vader's (the scene is also an homage to a similar one in issue #101 featuring Nightcrawler and his image inducer). More allusions to the Dark Phoenix Saga, as the issue opens with the X-Men being teleported aboard a Shi'ar ship, arriving while encircled by hostile troops and the Imperial Guard, and again later as Storm tells Corsair about Jean's death. 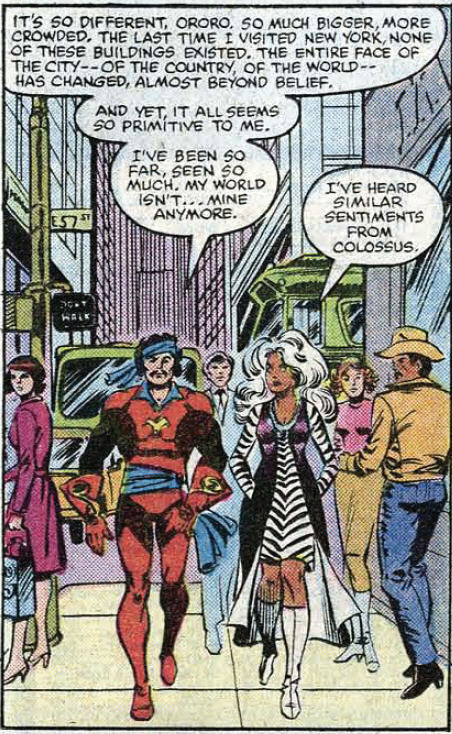 Colossus calls Storm "Wind Rider" as he succumbs to Deathbird's acid attack and believes himself to be dying, which seems an odd time to call Storm by her nickname. Professor X knows Lilandra is still alive, because he would have felt her death. I've always remembered this issue for its cliffhanger, which has always struck me as a very obvious cliffhanger generated by the conventions of the genre. Not only because I've only ever read this story knowing Colossus survives, but you don't have to read many comics to know that when a character is seemingly killed on the closing pages of an ongoing series, chances are they'll be back somehow. But reading this issue again, I wonder if what I've always seen as a pretty genre-standard ending actually scared some readers back in the day. We're not too far removed from the "Dark Phoenix Saga", when the writer of this issue helped kill off not only a member of the X-Men but one of the Marvel Universe's oldest characters. Given thirty years of additional stories featuring Colossus, it's easy to disregard the end of this issue; but in 1982, it's entirely possible this generated more than the usual amount of angst in readers. In the rest of the issue leading up to that cliffhanger, Claremont and Cockrum build nicely on the last issue, bringing in the rest of the X-Men and introducing the villains of the piece. While this story doesn't quite hit the transcendental synthesis of character and action that the Claremont/Byrne stories did (nor does it come close to the genre-bending "Dark Phoenix Saga" and "Days of Future Past", not that it's really trying to), it's shaping up as a quintessential Bronze Age story with fun action informed by consistent characterization featuring solid artwork. It may not be groundbreaking stuff, but the ship finally feels like its been righted. More fun with Deathbird and the Brood, and the return of the Starjammers. Don't forget, the corner box changed! I think that my first X-Men comic I ever read was two issues from this one, so that was the "real" corner box to me. Not the floating heads. Fun issue! I like when the X-Men get into battles in public, because it really doesn't seem to happen all that often. So a big fight with the Brood and Deathbird in Manhattan is nice to see. And a fight in a construction site is always a winning formula. Also, I love the cover to this issue. I'm not sure what it is, exactly, but the composition, coloring, and pretty much everything about it really impresses me. I might go so far as to put this on a "Greatest X-Men Covers" list, if for some reason I was ever to compile one. And we get the first use of one of my all-time favorite corner box designs ever! It's so much more dynamic and exciting than the typical static heads you usually see up there. It's too bad it doesn't last very long. And let me add that I love the way Joe Rosen writes credits. His lettering in general doesn't really jump out at me either way, but his credits are almost always done in this really clean, bold style, with nifty asterisks separating all the individual creators. I'm not sure off the top of my head if he did that for this issue, but I know he did it a lot during his time lettering Roger Stern's run on Amazing Spider-Man. "Deathbird, after debuting in Ms. Marvel's solo title, makes her first appearance in X-Men." "[The Brood] remain a relatively minor but still significant part of the X-Men's rogues gallery." "I can't imagine she was expected to generate a spike in sales; maybe Claremont just liked the character?" I know he wrote an issue of Marvel Team-Up that teamed Spider-Man with Tigra. (Art by John Byrne!) I just Googled "Chris Claremont Tigra" and learned that he also wrote a Tigra solo story in Marvel Chillers... both those stories featured Kraven the Hunter as the villain. Anyway, I guess maybe he does have a soft spot for her. "Storm is mildly resentful of Professor X turning to Cyclops before her." 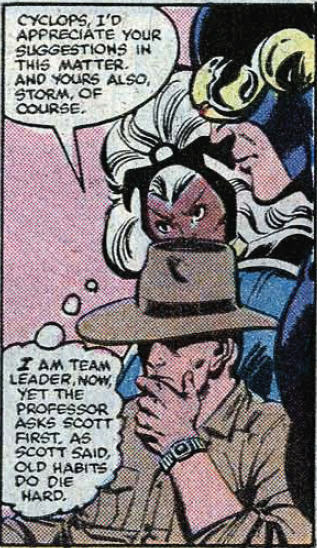 I love how Xavier tosses in that, "Oh, you too, Storm" afterthought. I might be a little miffed by that, too! 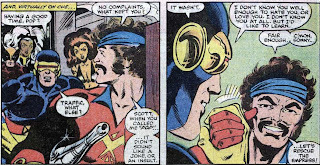 But that said, I'm glad to see Xavier going straight to Cyclops, and not accepting any substitutions or imitations. 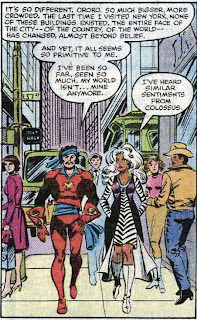 "...Storm and Corsair split off from the rest of the X-Men in order to, essentially, go sight seeing..."
And Corsair is walking around the streets of Manhattan in full space pirate regalia. That's awesome. Don't they pass the Marvel Comics offices in that scene? I don't believe it's called out, but I think they walk past Marvel's (then) address. And I thought they were seen by a real-world person (maybe Cockrum himself?)... I'm not sure, though. I'll have to look at the issue when I get home tonight. "Professor X knows Lilandra is still alive, because he would have felt her death." And for once in a work of fiction, that's not melodramatic hyperbole! "Given thirty years of additional stories featuring Colossus, it's easy to disregard the end of this issue; but in 1982, it's entirely possible this generated more than the usual amount of angst in readers...."
I wasn't there so I can't speak to this exactly, but for me -- and this could be colored by knowing Colossus survives too -- I seriously have trouble buying that any permanent harm will come to the characters during this run. In Cockrum's first run, if someone had died, I would've believed it. I certainly believed it during Byrne's run. I would believe it also from Paul Smith and John Romita Jr. and Marc Silvestri and Jim Lee. But there's just something about this second Cockrum run that reads like everything will always be all right in the end. I don't know why exactly... I can't put my finger on it. Claremont tries to sell it in the narration, but it doesn't come across in the art, which seems... tame, I guess. And just like last week, this is not meant as a slight against Cockrum. I love his artwork here. But it just seems very "Saturday morning cartoon"-ish. Nobody will die, and we'll all learn a valuable lesson in the end. Maybe it's the influcence of Joe Rubenstein and now Bob Wiacek? But again, I wasn't there when these issues came out. My opinion could certainly be colored by my knowledge that no one actually does come to any permanent harm here. But even taking that into consideration, I think my point is valid. I feel the same way looking at this issue as I did looking at the "Rogue Storm" cover from #147 -- "There's no way the readers of the time bought this, right?" YEARGH! I love these posts. Deathbird: If it's a threat it's a hollow one! Get it? Hollow, like a bird's bones? See what I did there? Oh, never mind; you're an idiot and I am trying hard to work in obscure bird jokes in the heat of battle. Tigra: And idiot in time kills nine! Deathbird: Your reference to the idea that cats have nine lives is all sorts of wrong. @Byron: Don't forget, the corner box changed! D'oh! I totally forgot about that. Thanks for pointing it out. And a fight in a construction site is always a winning formula. Agreed. Construction site fights are comic book gold. I might go so far as to put this on a "Greatest X-Men Covers" list, if for some reason I was ever to compile one. Whereas I have never been a big fan of it. It seems to lack energy, with everyone just standing around, and the focus of the cover, which should be the mortally-wounded Colossus, is way down at the bottom. t's so much more dynamic and exciting than the typical static heads you usually see up there. And just to prove how contradictory I can be, I actually much prefer the head shots despite the dynamic action of this corner box. I've just always been fascinated by the "roll call" nature of the head shots (and always used to get SO MAD when someone would leave the team and the corner box would fail to reflect that). Which isn't to say I dislike this one, just that I prefer the head shots. 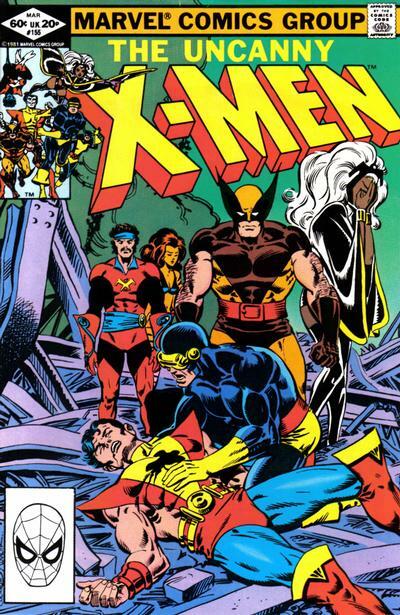 Has anyone ever than Chris Claremont ever done anything with them? Not too much. They were the villains of the Jim Lee-drawn crossover with Ghost Rider in X-Men vol. 2 #8-9, shortly after Claremont left, and then the two part Bryan Hitch series you mentioned that ties up some of the loose ends from Claremont's second Brood story in issues #232-234. After that, they've pretty much been fringe players, showing up in Contest of Champions II, Ms. Marvel's most recent series, some of Marvel's outerspace stuff like Planet Hulk and Annihilation, as well as one arc of Cable's most recent series (when he was jumping through time raising/protecting Hope). Anyway, I guess maybe he does have a soft spot for her. I'm not surprised; he definitely likes his strong female characters. And Corsair is walking around the streets of Manhattan in full space pirate regalia. Ha! Good point. I totally overlooked that, even though Storm took the time to change into street clothes. Huh. I just checked the issue and I think you're right. In the bottom left panel of page 9 they walk past a building with an address of "575", which I believe is Marvel's street address. And, judging by his past appearances, I'm pretty sure that's Dave Cockrum walking by them in that panel. Shoot - something else I'm bummed I missed! Thanks for catching it. But it just seems very "Saturday morning cartoon"-ish. Nobody will die, and we'll all learn a valuable lesson in the end. That's a good way to put it. This run, especially at this point, is very traditional superheroics, very classically Bronze Age stuff, and I think that shares a lot with the feel of Saturday morning cartoons. Even the very end of this story, when the X-Men believe they're going to die, works as well as it does because by then Smith has come aboard, and the whole thing has a gravitas it maybe wouldn't have had with Cockrum (ironically, since Smith came from animation). @Joan: YEARGH! I love these posts. And I love that you love them. I think the Brood showed up in one of Warren Ellis's Astonishing arcs (or were those genetically-modified offshoots ?). There was also another Brood story last year in Astonishing when Chris Gage wrote some fill-in issues... which is mostly notable for giving us Broo, the tame Brood youngling, with whom Jason Aaron is currently having fun over in Wolverine & The. @Rob: This was the first X-Men comic I ever read. Impressive. My continuous run starts with #102 and runs to present, but I have several dozen of the issues before that (#12 being the oldest). Yeah, those were genetically-modified offshoots, technically. Good to know. I'm so far behind in my current reading, that's right about where I leave off. This was during the infamous "Hank Pym: Wifebeater" storyline, in which Yellowjacket is brought up on charges by the Avengers after he shoots (in the back) a foe that Captain America had talked down (YJ was feeling insecure about his place on the team, so he wanted to look good by taking down the villain). In order to prevent himself from being kicked off the Avengers, YJ decided to build a robot so strong it would defeat the Avengers, but put in a kill switch only he knew about so he could "save" the day and look good. While he was working on it, Wasp came in and figured out what he was doing, and he gave her a taste of the back of his hand. The next day, at his court martial, the robot barges in, but YJ can't defeat it, so Wasp has to. YJ confesses everything and leaves the Avengers in disgrace. Eventually, he gets duped into stealing some adamantium for Egghead, goes to jail, and ultimately redeems himself. It's actually a pretty good story stretched out over a nice chunk of issues. Teebore -- "They were the villains of the Jim Lee-drawn crossover with Ghost Rider in X-Men vol. 2 #8-9." Oh yeah, I totally forgot about that! So other than that story, plus the John Ostrander/Bryan Hitch mini, it sounds like the Brood were basically exclusively written by Claremont up until a few years ago. Teebore & Sarah -- The original Yellowjacket storyline has a trade paperback release coming up, called "The Trial of Yellowjacket". Also, this will surprise no one, but Jim Shooter claimed on his blog that Pym was never supposed to hit Jan. Shooter says that the plot as he wrote it had Pym shoving her or something, and the artist (Bob Hall?) drew it as a full on backhanded slap. "Teebore -- "They were the villains of the Jim Lee-drawn crossover with Ghost Rider in X-Men vol. 2 #8-9." Oh yeah, I totally forgot about that! So other than that story, plus the John Ostrander/Bryan Hitch mini, it sounds like the Brood were basically exclusively written by Claremont up until a few years ago." You seem so driven to diminish the Brood's importance in X-Men mythology, Matt. WHY DO YOU HATE THE BROOD SO MUCH? WHY??? Love this cover. Love this issue. Love this saga. This definitely feels like X-Men to, after meandering through the Doom trilogy and the Hellfire Club comeback. Oh, and Matt, the Brood were also the villains in the second issue of X-Men/WildCATs, back circa 1996. I fondly remember the days of "black blood". You weren't allowed to show red. 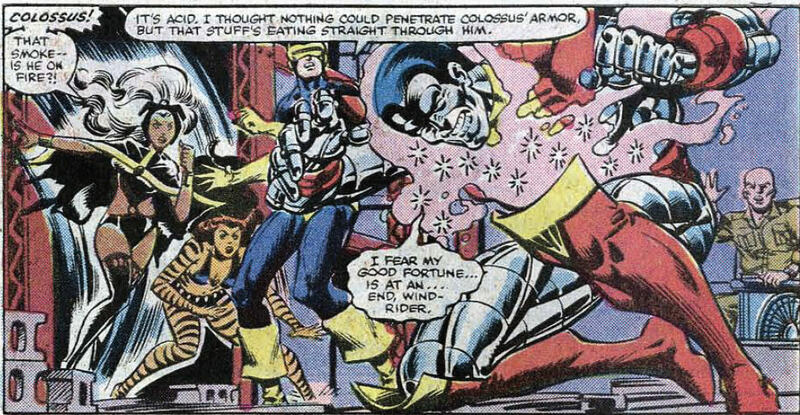 Colossus has so little of it on the cover, too; these days he'd probably be shown with his costume torn to shreds, sliced cuts all over his body, and thick red gobs of goo everywhere. I got that issue off the racks back in the day. Ms. Marvel was pretty good, and I'd been a fan of Marvel's first Captain Marvel since I picked up Giant-Size Captain Marvel #1, although while track records of creators (read: art I liked) and characters counted I was still at the age where I just picked up stuff that seemed cool at any given visit to the 5-&-10, drug store, or whatever. 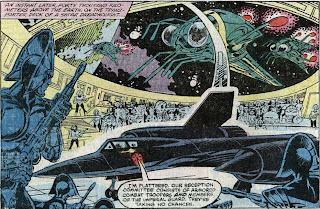 As I recall, I was surprised when Deathbird turned out to be Lilandra's sister in X-Men. 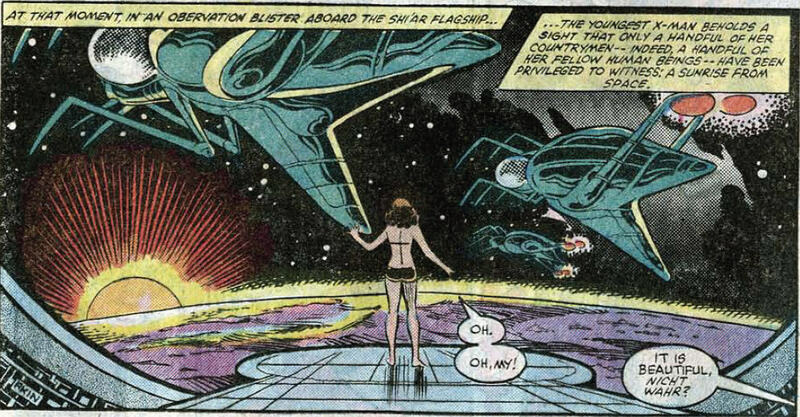 Claremont must have planned it all along, her being Shi'ar at least, but I don't think it was revealed until here. Carol Danvers, by the way, went from being a member of the US Air Force in her debut — the Captain Marvel feature in Marvel Super-Heroes, some of the first back issues I made a conscious effort to collect — to editor of The Daily Bugle's Woman Magazine as of Ms. Marvel. It's not impossible, of course, and it's not as all-over-the-map as some of the positions held by Carol's possible namesake Linda Danvers in pre-Crisis continuity alone, but the premise certainly felt out of left field. [Tigra's] appearance in this issue is largely superfluous, as she's simply the only Avenger who's home when the X-Men come calling. She helps out in the fight with Deathbird and the Brood and that's about it. I have no idea how her appearance came about. Claremont thought it was too unbelievable for none of the FF or Avengers to be on hand to help the X-Men, and, not having her own series, Tigra was the most available editorially? Really. Lilandra's exile? M'Krann Crystal? Phoenix? There's also what's probably another Marvel Girl in-joke there with a Phoenix / Mary Marvel mash-up costume worthy of Alex Ross. Which sort-of begs the question of how strong these rapports are. I guess they can literally cover light-years of space, which is impressive. At the same time, I can't help but think what an inhibition they must be for Xavier and Lilandra given the pair have opted to live apart; it can be hard enough to get an ex out of your thoughts when you meet someone new without psychic bonds factoring into the equation. VW: sublam — Me at my most sublime. Cyclops: "I daren't use any more power. My optic blasts at anywhere near full power would likely kill her." Um... But if they're not doing enough to subdue her now, wouldn't a slight increase be appropriate? You're bound to get to "knock her for a loop" before "kill her" if you keep turning it up a notch. Skür'kll, Warrior-Prime of the Brood: "The crippled mammal is a telepath!" Wasn't that the name of an LP from the Ruthless Dicks? Colossus looks in way worse shape, impossibly bad shape in fact, at the end of the story than he does on the cover, which is an odd switch from the cover suggesting far more dire straits (through symbolism, misdirection, or just a disingenuous attention grab) than the interior reveals. A pair of Avengers stars appear in this issue's Hostess strip. Hey, Teebore — Did anyone at SpringCon ask Bill Willingham to autograph a D&D ad? @Matt: And we get the first use of one of my all-time favorite corner box designs ever! At the risk of raining on your and Byron's corner-box parade — I like it too, actually — it strikes me as weird that the characters in front are charging at us while Nightcrawler is literally just hanging there. Of course it's only meant to be a pose, but somehow that makes me chuckle. @Teebore: I've just always been fascinated by the "roll call" nature of the head shots (and always used to get SO MAD when someone would leave the team and the corner box would fail to reflect that). Me too. Yet as much as I did like the head shots — and I remember scanning them on Avengers, especially, for changes to the official roster — I also really enjoyed the full-figure action shots that came next (at Marvel; DC used them earlier in the '70s and then again briefly in the '90s). Bonus points went to different poses on corner boxes of different series devoted to the same character and irritation sometimes resulted when the art style of the corner-box shot was too different from the main cover art. @Teebore: This run, especially at this point, is very traditional superheroics, very classically Bronze Age stuff, and I think that shares a lot with the feel of Saturday morning cartoons. I associate "very traditional superheroics" much more with the Silver Age, actually. For me the Bronze Age is all about superhero sagas getting darker, more complex (both within and among various series in the same continuity), and more socially relevant, taking its cue from end-of-Silver-Age stuff like the O'Neil & Adams Green Lantern / Green Arrow, with both that material and a resurgence in supernatural / occult / horror stuff pushing back against the Comics Code. Among folks who put a gap between the Silver and Bronze Ages rather than beginning the latter in 1970 I've often seen its start date pegged to Giant-Size X-Men #1 in 1975 for the very reason that the "All-New, All-Different" team exemplifies Bronze Age superheroics. Which is not to say that I disagree with the "very traditional superheroics" assessment of this story, but rather that I disagree with the association of it with "very classically Bronze Age stuff"; in this instance, Claremont & Cockrum are putting out some very straightforward action plots that are almost Silver Age in style but inflected with bits of the Bronze Age X-Men angst. 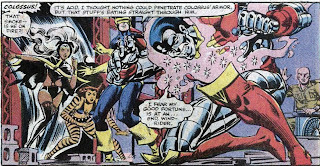 @Teebore @Falen: This was during the infamous "Hank Pym: Wifebeater" storyline, ... It's actually a pretty good story stretched out over a nice chunk of issues. I was glad to read that last part, because I see a lot of joking around here about the admittedly infamous backhand slap Hank gave Jan. Hank's mental issues date back to his appearance / revelation as the initially enigmatic Yellowjacket, an example of what's now called dissociative-identity disorder. I'm not saying this to advocate for PC awareness of mental health, just to point out that all of this is merely one facet of Hank Pym's character that apparently came to define him in fandom as a bit of a dark joke since I last read Marvel regularly (or really at all) about a decade ago — which is particularly strange given that what used to define him as a joke to many readers was that the guy was Ant-Man; he didn't even have The Wasp's bio-sting powers until he became Yellowjacket after first gaining more credibility as Giant-Man / Goliath. He's actually been a rich character and one of my favorites up through Busiek & Pérez's Avengers run. Jason -- "WHY DO YOU HATE THE BROOD SO MUCH? WHY???" Well if you must know, it's because they once implanted an egg in my belly! Are you happy now?! I thought I'd moved past that, but you just brought it all back to the surface!! But really, I have nothing against them... they don't do much for me either way. I was just observing that no writers other than Claremont seemed to want anything to do with them. However, I have since been corrected by you and Teebore. Blam -- "Claremont thought it was too unbelievable for none of the FF or Avengers to be on hand to help the X-Men, and, not having her own series, Tigra was the most available editorially?" In this scenario, I actually find it more unbelievable that only Tigra would be there. If the Avengers were out on a mission, I'd expect her to be with them. If she was on monitor duty, you would think at least one or two other Avengers would be available. Personally, I would've liked to have seen Hawkeye involved, since he'd fought Deathbird before. Blam -- "Colossus looks in way worse shape, impossibly bad shape in fact, at the end of the story than he does on the cover, which is an odd switch from the cover suggesting far more dire straits (through symbolism, misdirection, or just a disingenuous attention grab) than the interior reveals." COuld it be a Comics Code thing? Maybe they didn't want to be too gruesome on the cover since the issue would be displayed on newstands everywhere. There was a time when such a thing was actually a concern! "A pair of Avengers stars appear in this issue's Hostess strip." 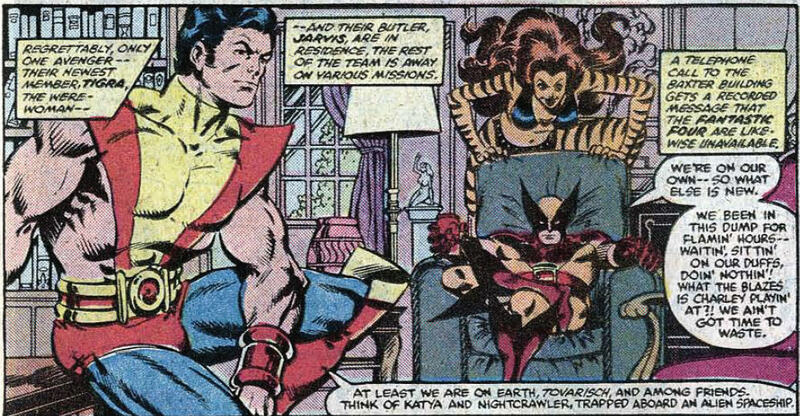 If only some coordination between editorial and whoever ran ads could have given us a footnote on the page where the X-Men are at Avengers Mansion, stating that we should see the Hostess ad on page #whatever to find out why Tigra was the only team member home at the time. Blam -- "I'd prefer some consistency here. Spell it out or use numerals, but pick one! 8^)"
I would love to, but I'm just following the precedent set by Marvel in the 80's...! Though I admit I just now noticed I'm doing it backwards... to write it correctly in the Mighty Marvel Manner, it should read: "PART 1 IN A TWO-PART COMMENT". I'll have to watch that going forward. Blam -- "I also really enjoyed the full-figure action shots that came next (at Marvel; DC used them earlier in the '70s and then again briefly in the '90s)." Marvel also used them previously. For part of the 60's and practically all of the 70's, Amazing Spider-Man featured a John Romita Sr. Spider-Man figure standing motionless in the corner box/circle. I think the Hulk had a full figure in the 70's, too... so other characters probably did as well. And I agree with you about different boxes for the same character in multiple titles. Spidey is of course the first example to come to mind for that, also. @Matt: The original Yellowjacket storyline has a trade paperback release coming up, called "The Trial of Yellowjacket". Good to know. I might have to pick that up, just to have the story handily in one place. @Michael: This definitely feels like X-Men to, after meandering through the Doom trilogy and the Hellfire Club comeback. The Brood are some of my favorite villains. I've always enjoyed them too, in part because they've been used relatively sparingly. Blam: Claremont must have planned it all along, her being Shi'ar at least, but I don't think it was revealed until here. I haven't read anything confirming it, but I feel like he had to have introduced Deathbird at least knowing she was Shi'ar. And yeah, the sister reveal doesn't occur until now (well, next issue, technically). ...but the premise certainly felt out of left field. I think there's a panel in Avengers Annual #10 that pretty much serves as Carol's resume, and it's hilarious for how matter-of-factly it lists all the varied occupations of her short life. 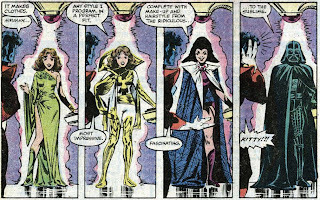 Even with his trademark tics, in those days especially Claremont's flag-waving for strong heroines was admirable. Indeed; I meant to point that out. Ha! Not to my knowledge, but now that you mention it, I should have. Maybe next year. For me, the Bronze Age is about taking the Silver Age sensibilities and applying, as you mentioned, a bit of social relevance as well as a greater concern for continuity (character and storywise) born of the presence of writers who grew up as comic book fans and the knowledge that the audience isn't turning over as quickly as it was once was (meaning writers were more comfortable with longer stories and developing the characters over time). Of course, as a result of that, the stories were darker than their Silver Age inspirations, but I like to separate the real significant "darkening" of comics, in terms of both tone, storytelling style and the foolish excess of the 90s from the Bronze Age. But I'll grant it's a largely academic (and personal) position. I was glad to read that last part, because I see a lot of joking around here about the admittedly infamous backhand slap Hank gave Jan. While I do love to crack jokes about Hank Pym and that infamous slap (perhaps more than I should) I am a huge fan of the character (if I ever get around to doing a post about my ideal Avengers lineup, he'll be front and center) and have long enjoyed his ongoing development, from his first post-Ultron, Yellowjacket breakdown to his "Dr. Pym" days with the WCA to his more recent "Scientist Supreme" role. He's definitely a character I feel deserves more respect, even as I undermine that by cracking jokes about him. I guess I kid cuz I love! 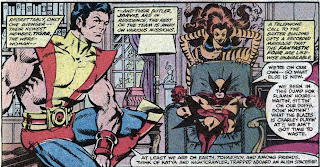 @Matt: If only some coordination between editorial and whoever ran ads could have given us a footnote on the page where the X-Men are at Avengers Mansion, stating that we should see the Hostess ad on page #whatever to find out why Tigra was the only team member home at the time. Ha! I meant Avengers stars in reference to the movie, however; it's Captain America with Nick Fury, who isn't himself officially an Avenger even in the film. @Matt: Marvel also used [the full-figure action shots] previously. I worded that poorly, yeah, because it sounded like Marvel switched to figures in the corner box for the first time. That Spider-Man figure who just stood there, arms at his side with clenched fists, always struck me as intriguingly boring (for lack of a better phrase). @Teebore: For me, the Bronze Age is about taking the Silver Age sensibilities and applying, as you mentioned, a bit of social relevance as well as a greater concern for continuity (character and storywise) born of the presence of writers who grew up as comic book fans and the knowledge that the audience isn't turning over as quickly as it was once was (meaning writers were more comfortable with longer stories and developing the characters over time). I think that's a spot-on assessment. @Teebore: I'll grant it's a largely academic (and personal) position. I heard about that and it makes me want to catch up on Avengers / Marvel in general (which is largely impossible: 10 years!) almost as much as all that crap with Norman Osborn makes me glad I missed it. @Matt: By the way, are they still hyphenating Deathbird's name at this point? Nope, she's "Deathbird" at this point. The crap with Norman Osborn actually wasn't that bad, simply because we the readers as well as the vast majority of heroic characters knew he was evil, that his position of power was ill-gained, that it was only a matter of time before he snapped, etc. Whereas the stuff which preceded it, with Tony Stark as America's top cop, was a lot crappier because it was unclear if we were supposed to be rooting for him or against him. When Norman Osborn abuses his power, you KNEW it was a bad thing, but when Tony Stark did it, it was less clear if Marvel thought that was bad, if we were supposed to think it was bad, if the characters were, etc, and that made reading it a lot less fun.